Explanation: For 55 consecutive nights Mediterranean skies were at least partly clear this summer, from the 1st of July to the 24th of August 2018. An exposure from each night was incorporated in this composited telephoto and telescopic image to follow bright planet Saturn as it wandered through the generous evening skies. Through August, the outer planet's seasonal apparent retrograde motion slowed and drifted to the right, framed by a starry background. That brought it near the line-of-sight to the central Milky Way, and the beautiful Lagoon (M8) and Trifid (20) nebulae. Of course Saturn's largest moon Titan was also along for the ride. Swinging around the gas giant in a 16 day long orbit, Titan's resulting wave-like motion is easier to spot when the almost-too-bright Saturn is digitally edited from the scene. Brilliant! Surely our own Moon's monthly motion also contributes to the drunken path of Saturn? Which Moon contributes most? Oh, I guess I mis-understood (as I so often do) ! It is literally the motion of Titan itself. I guess the reactions I was referring to are too small to detect? Maybe this is just a matter of semantics, but Saturn isn't really 'wandering' through the Earth's evening skies over the 55 nights. It is actually the much more speedier planet Earth zipping by the more slower Saturn. It would be a good idea to do a mouseover with the one that shows Titan. There is a mouseover Titan-only version, actually. Maybe this is just a matter of semantics, but "much more speedier" and "more slower" aint proper English. planet (n.) late Old English planete, from Old French planete (Modern French planète), from Late Latin planeta, from Greek planetes, from (asteres) planetai "wandering (stars)," from planasthai "to wander," a word of uncertain etymology. Beekes notes the similarity of meaning to Greek plazein "to make devious, repel, dissuade from the right path, bewilder," but adds, "it is hard to think of a formal connection." Glad we got all THAT cleared up! I'm late to the party, but I'm very happy to see an APOD by Tunç Tezel, who is a mainstay at Starship Asterisk* and has contributed to so much to the Latest Photography forum. 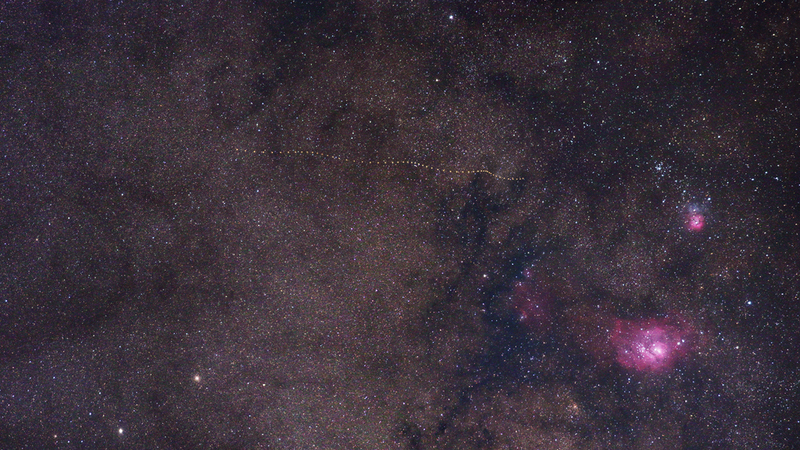 And I loved heehaw's description of what he thought was Saturn's "drunken path" across the sky. That drunkenness of the majestic ringed planet is what I thought I saw too, because at first I got a mouseover that made me see only the path of Titan. It's a lot of fun to compare the path of Saturn and the path of Titan.